Scientists are looking at gravitational waves to understand the growth of supermassive black holes. Black holes are regions in space where gravity is so strong that nothing, not even light, can resist its pull. It is believed that every galaxy has a supermassive black hole (SMBH) in its center. Gravitational waves can best be described as small waves or ripples that travel through the fabric of space-time. It is like putting a bowling bowl on a mattress and rolling it forward. The indentations surrounding the bowling ball as it rolls can be described as a gravitational wave. Einstein theorized that similar to the mattress, the dimension of space-time warps and curves as planets and other objects of big masses move along it. These curvatures generate ripples (waves) in space-time that travel outward at the speed of light and diminishes in energy as it goes further out. Although gravitational waves have not yet been directly discovered, there have been indirect observations of its existence using radio signals from a pulsar. In this latest study, scientists believe that by studying the connection between the strength of a gravitational wave and how two colliding supermassive blackholes behave (their mass, distance between each other and how often it spirals and merge), it will help explain the growth of black holes. A paper in today's issue of Science pits the front-running ideas about the growth of supermassive black holes against observational data — a limit on the strength of gravitational waves, obtained with CSIRO's Parkes radio telescope in eastern Australia. 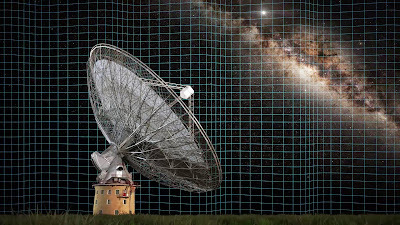 "This is the first time we've been able to use information about gravitational waves to study another aspect of the Universe — the growth of massive black holes," co-author Dr Ramesh Bhat from the Curtin University node of the International Centre for Radio Astronomy Research (ICRAR) said. Einstein predicted gravitational waves — ripples in space-time, generated by massive bodies changing speed or direction, bodies like pairs of black holes orbiting each other.